Lie flat on your back with your legs extended. For more pressure on your lower back, bend your knees with feet flat on the bed/floor. Lie on your stomach with your arms under your head or alongside your body. Breathe slowly and deeply. For maximum contact with acupressure points, roll-up a towel and place it under your neck and the acupressure mat. You may order an optional Heavenly Acupressure Pillow. Lie on your side with the acupressure mat under your hip and thigh. Relax for 10 minutes, then turn around to treat other side. 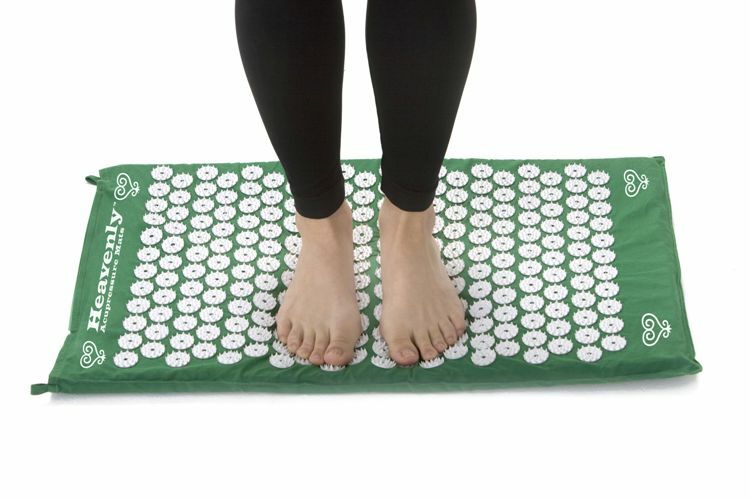 Sit with your buttocks in full contact with the acupressure mat. For a stronger effect on the back of your thighs, reach for your toes and relax. You can also sit on a chair with the mat underneath you (great for long days at a desk). Place the acupressure mat under a pillow or roll it up. Gently place the side of your face on the acupressure mat just like you would with a pillow. Use a thin piece of cloth between your face and the acupressure mat if the sensation is too intense. Remain in this position for a few minutes, then turn your head to the other side. Place the acupressure mat under your lower back and buttocks. Bend your knees up and place your feet on the floor/bed for increased benefit. Stand on the Heavenly Mat with bare feet. After a while you may gently lift one foot up for a stronger effect on the standing foot. Stimulation of pressure points in the feet, also known as zone therapy or reflexology, is said to affect areas of the feet that practitioners believe correspond with organs in other parts of the body. When you are ready you can advance to our Acupressure Mat Programs to get a full-body acupressure experience.